“Grown not flown” is the mantra of almost every local flower grower. Did you know that more than 80% of cut flowers are produced in foreign countries and are imported into the US via plane? Many of these flowers are sprayed with chemical pesticides and herbicides. Once you buy those flowers at the grocery store, they are often days old which cuts down on the vase life once you bring them home. Locally grown flowers are superior in quality, appearance, and vase-life. Since we harvest flowers almost every day, you can be confident that our flowers are fresh and will have a long-lasting vase-life. Additionally, since our flowers aren’t shipped across the globe, we can grow a wider variety of flowers that you aren’t likely to see at the grocery floral department. You can find our bouquets at the market every Saturday. We can also provide flowers for your special events in the form of Do-It-Yourself buckets. Each bucket comes with a mixture of focal and filler flowers for you to make your own arrangements at home. DIY buckets are great for many events including weddings, parties, baby showers, and funerals. Find more details on DIY buckets below. DIY buckets at $85 each. Each bucket has 70 to 80 stems. Generally, a regular mouth (not wide mouth) quart sized mason jar arrangement has about 10 - 15 stems. So you can estimate that one bucket could make 5 to 6 mason jar arrangements. If you use bud vases, the flowers will obviously go further. DIY buckets include a good mix of flowers are will create a nice arrangement. We use a formula to include focal, airy and filler flowers so that arrangements look full and complete. Generally, it’s Farmer’s Choice on what colors we are able to provide. With the Farmer’s Choice option, you will get a nice selection of mixed colors that will make lovely arrangements. Color Choice may be available at certain times of the year. Just ask and we’ll let you know what we can provide. Color choice buckets will be $100 per bucket for 70 to 80 stems (just a little more pricey to make sure you get exactly what you want). Larger, Wow flowers like sunflowers, glads, mums, and dahlias are sold by the stem for around $1.25 - $2 per stem depending on the size of the bloom. We can do straight buckets of these larger flowers that we will charge per stem instead of the bucket price. Usually, you don't' need a ton of the larger flowers (if at all). They can make a nice focal point in an arrangement or bouquet but the flowers in the DIY buckets stand alone just fine without the larger flowers. 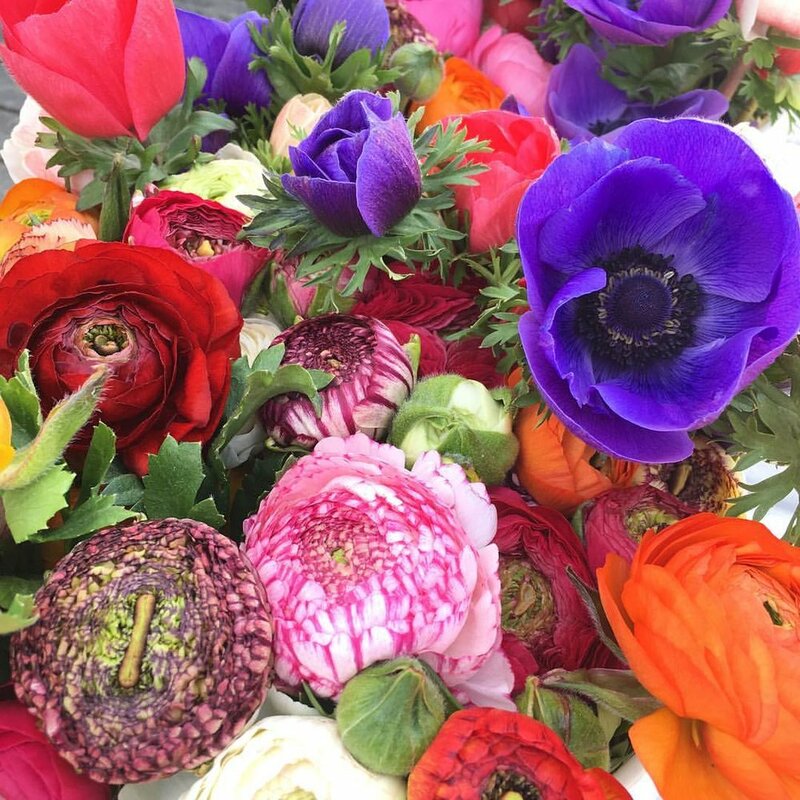 If you want some of these "wow" flowers, we can help you figure out how many to order to put in your bouquets or arrangements. DIY Bucket, 70-80 stems, Farmer's Choice Colors $85. DIY Bucket, 70-80 stems, Customer's Color Choice $100. One DIY Bucket can make 5 to 6 regular mouth mason jar arrangements (10 to 15 stems per mason jar). One DIY Bucket can make 3 to 4 larger sized bouquets for bridesmaids (15 to 20 stems per bouquet) or 2 very large bouquets (30 to 40 stems per bouquet). Larger "wow" flowers like gladiolus, mums, sunflowers and dahlias are sold by the stem ranging in price from $1.25 to $2 per stem. We do farm pick up on Thursdays and Fridays or market pickup at the Carrboro Farmers Market on Saturday mornings.